I was afforded this opportunity because I am part of the BlogPaws Professional Blogger Network. The Alpo dog biscuits were provided by Nestlé Purina. Future Expat only shares information we feel is relevant to our readers. The opinions in this post are my own. Last week, Milo and I moved into our new home and Alpo Wholesome Biscuits are helping him adjust. I get bored with things, including homes, and enjoy transforming a dated house into a stylish home. However, Milo has had a different experience with moving. Dogs don’t understand what is happening when they move. All they know is that their familiar place, and maybe the people too, are gone. Milo spent his first 2 years on a farm overloaded with dogs (40 of them!). One day, he was loaded up into a cage in a van (probably the first time ever in a vehicle) and driven across the state. I can only imagine how scared he was. When he was let out, everything was new. Including the people. He spent one month getting very attached to his foster mom, and then one day she took him to a pet store for an adoption event and a stranger (me) took him away. He never saw his home or foster mom again. If you look at it from his point of view, moving is a pretty scary thing. I know that he will adjust, but Milo is very sensitive. When I took him on a 2 week road trip last spring, he stopped eating and got extremely clingy. So I really wasn’t surprised when he started showing signs of anxiety as I began packing for the move. Luckily, the Alpo Wholesome Biscuits I received for this review arrived just in time to ease the transition. I let him try out these tasty dog biscuits before the move, so he would have something to get excited about once we were in the new house. While Milo loves most treats, his favorites are big enough for him to bite in half and then crunch away for a few more bites. If treats are too small, he literally inhales them without getting to enjoy the flavor. 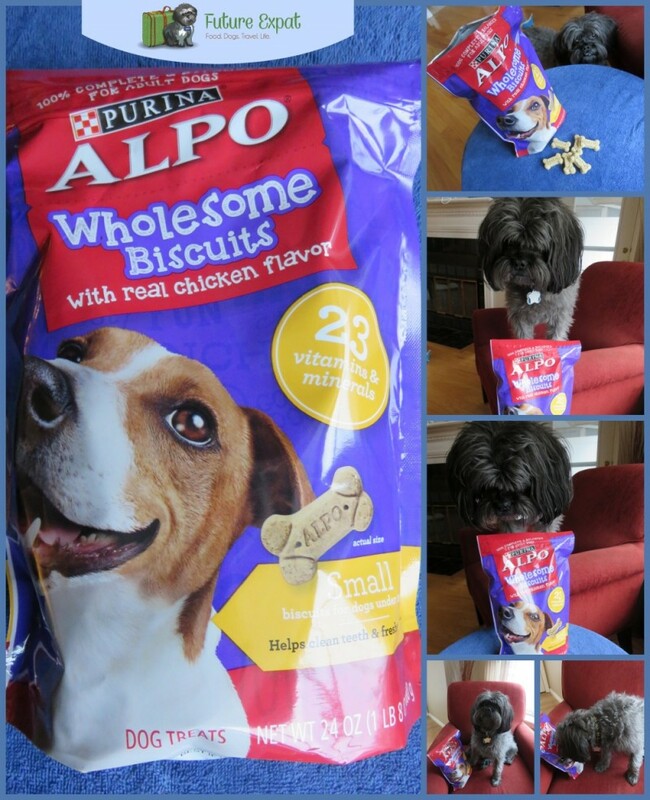 The brand new Alpo Wholesome Biscuits hit the stores last month and come in small, medium and large sizes so there is a perfect size for every dog. The small size is just right for Milo. It is big enough to let him crunch away but not so big that it will add a ton of calories to his diet if he gets a couple every day. And they are healthy too. Each dog biscuit has 23 vitamins and minerals plus calcium for strong bones and teeth. I snapped a little video of Milo trying out his new treats. I was really glad that the Alpo dog biscuits came before the move, because I’ve been using them to help him settle in. I took this quick video the first morning in our new home. The Alpo Wholesome Biscuit line is so new that it isn’t even listed on Alpo’s website yet, but you can pick them up at the grocery store or your favorite pet store on your next visit. 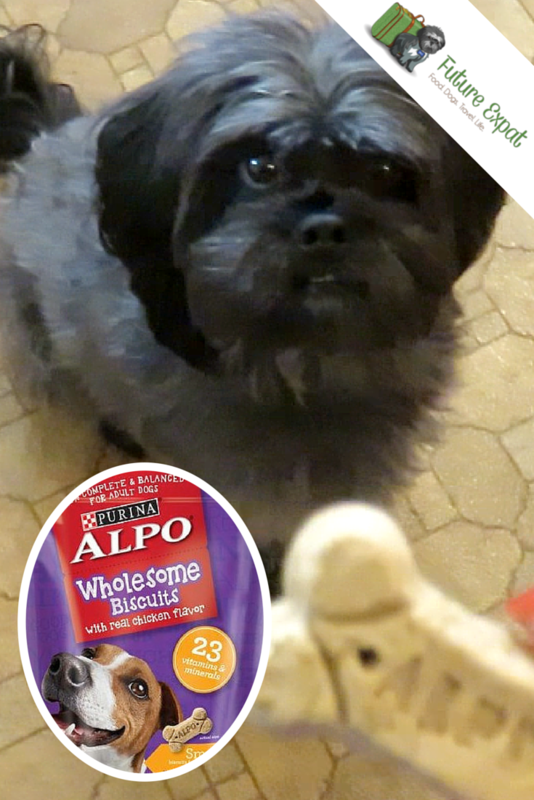 BONUS…Alpo’s new biscuits are so affordable that anyone can get them for their dog, even those of us on a tight budget. I’ve tried a LOT of different treats between what I get from rescue groups for my foster dogs and the samples I get as a blogger. The Alpo Wholesome Biscuits are treats that I’ll be spending my money on. I hope you’ll give them a try because I am confident you’ll like them as much as I do. Milo is SOOOO cute! Love the videos! We just adopted a dog on Saturday and will definitely check out these new Alpo treats for our Annie! I like that they are actually nutritional since she is still a bit underweight and we are trying to get her weight up and tummy settled. Congrats on the new house and yard too! Your pup is so cute!! We adopted our beagle mix just this past summer and he is now over a year old. We are very aware of transitions for him, too. We are also thinking of moving this year and will follow your idea for an easy move. Great post and enjoyed your video, too. Mind sharing how you add video to WP? Hope you love your new home. I’m glad my tips might help you in your upcoming move. As far as video, it’s really easy to add videos. You can simply paste the URL of the video into the editor. Not the html side, but the regular editor. Do a save and it will replace the URL with a preview of the video. That said, I don’t like my videos to show random recommended videos from YouTube at the end of my videos, so I actually grab the embed code from YouTube (under the share option) and deselect the random videos option. Then paste the code into the html view of your editor. You can do this with videos uploaded to any of the other big sites too, not just YouTube. If you have any trouble when you try it out, let me know and I’ll happily talk you through it. Milo is the best doggie model for these treats! My dog’s favorite treats are Alpo Variety Snaps so I’ll definitely try these out!! I’ve always liked Alpo treats, I gave them to my Cocker Spaniel for 12 years & Magnum, my pit bull mix, has been eating them for 6 years. I’m sure he’ll like these, too!